Location: Ride Studio Cafe in Lexington, MA and Ride Headquarters -- depending on the start date. See details below. Date & Time: 5 Dates, one each month starting in May! Distance: 100-120 miles -- each route in the series is different. Details below. The first Adventure 500 ride was supposed to be a cold, rainy day. Riders joining in had a sunny morning before the rain came. We're offering this first ride again on June 2 so you can participate if you didn't have a chance or weren't interested in riding in the cold rain for the first ride. This is at Broadsheet Coffee in Cambridge, the first stop for some and the start for others. Five long road rides. 500+ miles. Some dirt. All adventure. Description: The Adventure 500 Series is comprised of one century-plus ride each month beginning in May. The average pace is 16 mph for one group, and about 17-18 mph for a second group. If we have more participation, we'll break up into more groups with about 10 people per group. DONE & DUSTED - May 19: Saturday, 8:00 am departure from Ride Studio Cafe. Optional start at 9:00 am from Broadsheet Coffee in Cambridge. About 110 miles. DONE & DUSTED - June 2: Rain Date for Ride #1! We're offering this second departure for those who didn't want to ride the May 19 ride of 110 miles in the Rain... Saturday, first group has a 7am departure from Ride Studio Cafe. Doors open at 6:30am. Will have multiple groups and staggered rollout times. Optional start at 8:30am from Broadsheet Coffee in Cambridge. About 110 miles. DONE & DUSTED - June 16: Saturday, 8:00 am departure from Ride Studio Cafe. About 110 miles. DONE & DUSTED - July 21: Saturday, 8:00 am departure from Ride Studio Cafe. About 110 miles. DONE & DUSTED - August 25: Saturday, 8:00 am departure from Ride Headquarters. About 110 miles. NEW DATE - October 6: Saturday, 8:00 am departure from Ride Headquarters. About 110 miles. Series wrap-up party after the ride! Proper Bike for this ride: 25-30mm road slick tires, clipless pedals, drop handlebars; no aero bars. Route: Approximately ~110 miles. Destination: All new routes so don't miss out. Ride Notes: There are plenty of stops planned for each route. There will be some dirt on every ride of the series -- somewhere between 10 and 30% dirt. There are some rough sections of road and there is a possibility of a small amount of dirt road/construction work. Estimated time: About 8 to 12 hours depending on the time of year, the weather, and pace of the group. Last Minute Information: Watch Ride Studio Cafe's Twitter feed for last-minute updates, weather cancellations or other changes. Waiver: RSC requires a signed waiver before your first ride. Please fill it out online prior to your first ride. RSVP so We Know to Expect You! Note: RSVPs are required at least 24 hours prior to the start of the ride(s) to be eligible for most of the offers tied to this series, as well. Where you are reachable during the ride. Receive more cool stuff for each ride you do with us. On your first ride, you receive an Adventure 500 punch card. Collect all the punches! 1 punch: Custom sticker for that ride. 2 punches: Receive a 2-cafe-drink punch card. 3 punches: Adventure 500 T-shirt. Value $40. Or, save your three punches for the four- punch offer. 4 punches: 50% off the Adventure 500 CdC vest. Adventure 500 embroidery costs an additional $60. Or save the four punches for the five-punch offer. 5 punches: Free Adventure 500 Vest if you do all five rides. Value $190 includes embroidery. Bonus: For each ride you do, you receive a custom commemoration decal you can put anywhere. We recommend putting them on your top tube. Collect them all! Available only to riders who RSVP at least 24 hours prior to the ride(s). Reflective decals commemorate the first ride for riders! Each ride offers a commemorative decal for all who participate. Come out to see what your decal will look like affixed to your bike! Join us for at least one ride and you can take advantage of any of the offers. Two offers also have elements that are only available during the day of the ride. See below for details. RSVP for the ride . Don't just show up to a ride, RSVP at least 24 hours in advance. These offers are available anytime from May 1 through September 16, 2018. 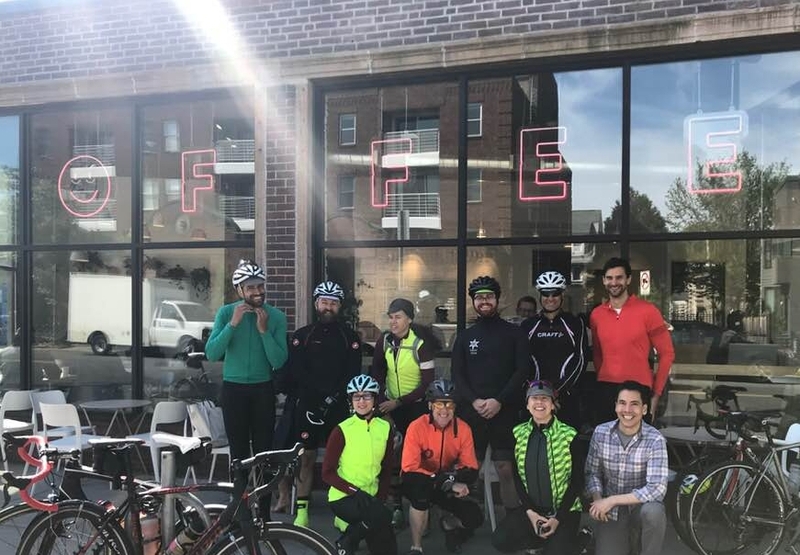 $30 of value: For May's ride only: We're covering breakfast and drinks at Broadsheet Coffee Roasters in Cambridge. We're also providing a voucher for a free bag of an amazing Guatemalan coffee roasted specifically and exactingly by Broadsheet for RSC and HQ called the "The 500" roast. This limited edition coffee is aptly named: after you're done riding 500 miles, nothing will pick you up like it will! Available while supplies last. Can't make it to the ride? We have these for sale throughout the month of May at Ride Studio – the only place where it can be found! $70 of value: For June's ride only: Receive a limited edition Cafe du Cycliste water bottle. The first 25 people to RSVP will get a water bottle the day of the ride upon returning to Ride Studio. Also from CdC you can receive a special price on the Adventure 500 Series CdC vest! $150 of value: We have a special endurance ride wheel design with Industry Nine. We're also covering the cost of one level of customization upgrade at an average value of $125. This offer includes custom reflective rim decals that are not available for sale. $200 of value: Purchase any Stages power meter and receive free Installation and computer syncing and optimization. We'll also provide free labor on a full bike tune-up when we install the power meter. $600 of value: On Honey's brand new endurance performance bike: The MidDurance Titanium bike. Honey is providing upgrades worth $600 toward the bike including parts kit upgrades and limited time offers.